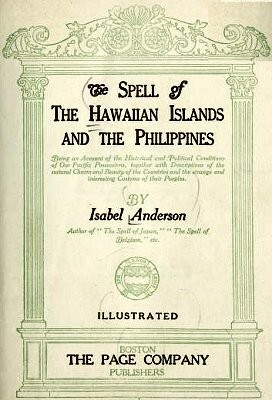 isabel anderson : surf riding in hawai'i, 1916.
and the strange and interesting customs of their peoples. As we approached the dock, we forgot to watch the frolicking porpoises and the silver flying fish, at sight of the daring natives on their boards riding the surf that broke over the coral reef. Waikiki and watched the surf-boating, which was most exciting, even from a distance, as the canoes came in at racehorse speed on the crest of the breakers. 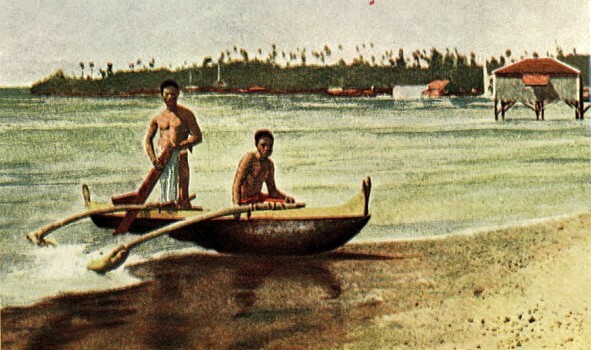 That day L. and I put our bathing suits on, as we did indeed several times, got into an outrigger canoe with two native boys to handle it, and started for the reef. They skilfully paddled the boat out between the broken waves, waiting for the chance to move on without meeting a foaming crester, and then hurrying to catch a smooth place. At last we got out far enough and turned, watching over our shoulders for a big fellow to come rolling in. Then the boys paddled wildly and allowed the crest, as it broke, to catch and lift the boat and rush it along on top of the roaring foam, right up to the beach. 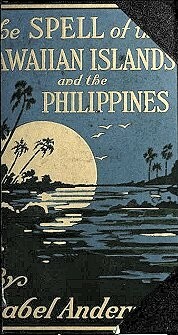 On one of our trips our oarsmen were a little careless and we were upset. But instead of swimming in shore we swam out to sea and pushed the boat until we were well beyond the breakers, where we could right it again and get in — which, for those not used to it, is not a particularly easy thing to accomplish. The people on the shore became frightened about us and sent out another boat to pick us up, for we were quite far out and there were many sharks around. day whether sharks really do eat men, notwithstanding two men were bitten lately while bathing as far north as on the New Jersey coast. I will simply say I have seen a black diving boy at Aden with only one leg, as the other was bitten off by a shark, and have myself even worn black stockings when bathing in tropical seas because it is said sharks prefer white legs to black. Boxing, surf-riding and hurling the ulu — a circular stone disk, three or four inches in diameter — were some of the favourite amusements, as well as tobogganing, which is interest- ing as a tropical adaptation of something that we consider a Northern sport. pery with dry pili grass. The sled, of two long, narrow strips of wood joined together by wicker work, was on runners from twelve to fourteen feet long, and was more like our sleds than modern toboggans. The native held the sled by the middle with both hands, and ran to get a start. Then, throwing himself face downward, he flew down the hill out upon the plain beyond, sometimes to a distance of half a mile or more. The Hawaiians also plant taro for poi, which, although now manufactured by machinery, is still their favourite food, and is also eaten by the whites: Doctors pronounce it most digestible and strengthening. Duke Kahanamoku, a native who has always lived on poi, is the champion swimmer of the world. It is true that not only poi but also the climate is favourable to our race as well, for white boys brought up in Hawaii have proved themselves to be strong, all those who have gone into athletics in American colleges having made fine records. On the shore , at the extreme western point of the island [Kaui], are the Barking Sands, a row of sand dunes. "The wind on the sands makes them rustle like silk; to slide down them produces a sound like thunder; to stamp on them makes them cry out in different cadences." Not far away is an old bathing beach, where a bath was supposed to bring good luck. Geoff Cater (2013-2018) : Isabel Anderson : Surf Riding, Hawaii, 1916.